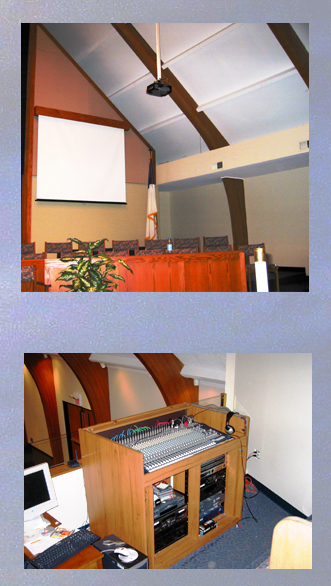 Home Theater & Sound Systems Installation for Churches in Columbus OH | AccuPro Audio Video Inc. Copyright 2009 AccuPro: AV Equipment Rental. All Rights Reserved. For your business, we offer commercial products featuring the latest technology. We install board rooms, training rooms auditoriums, church sound systems, large electric screens, projectors that drop electronically from the ceiling, sophisticated audio/video systems for teleconferencing or recording equipment can enhance your meetings, conference rooms and training spaces. We can custom design and install a system to your exact requirements. We also can install other solutions throughout your building, including in-house cable TV systems, nursing call systems, access controls, paging, closed circuit camera systems, background music systems, digital signage, and sound masking systems. The quality and performance of AV systems for churches have become increasingly important. We carry video cameras that are designed specifically for church applications, including complete TV studios with remote controlled cameras. We can also provide the latest in video editing for streaming your service to the web. When it comes to sound, we can custom design a sound system for your building's unique acoustics, including line array speakers with computer modeling. For residential installs, we offer the latest in home theater projectors and LCD high definition televisions. Including 3 D images. Our wide distribution sources allow us to provide many choices for your theater room; from custom screens to projectors that compete with the best plasma and LCD HDTVs. We carry speaker manufacturers that are top rated by most magazines yet still have a reasonable price tag. Touch panels for remote controls are the “in” thing and can be programmed to control just about everything in your home. In addition to your installation, AccuPro provides service on the equipment we sell. We do service work for major retail chains for their sound and video equipment. We also offer projector servicing and cleaning, as well as AV equipment rental for just about any application. Give us a call today!